Economical Push action retractable with bowed clip. Blue writing ink. 250 1 color(s) imprint at $194 ONLY $0.78 each. 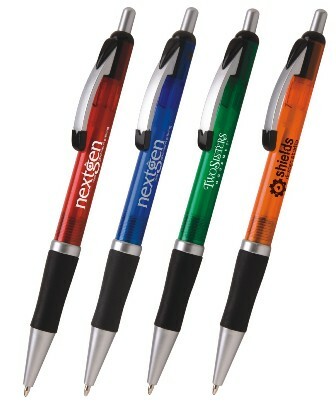 500 1 color(s) imprint at $247 ONLY $0.49 each. 1000 1 color(s) imprint at $353 ONLY $0.35 each. 2500 1 color(s) imprint at $673 ONLY $0.27 each. 5000 1 color(s) imprint at $1,333 ONLY $0.27 each.